I've had to for 2 yrs now. You can tell it is faux but it looks great. It I need to wash it I take it out onto my driveway and scrub what may need it, house it off and dry out out in the sun. 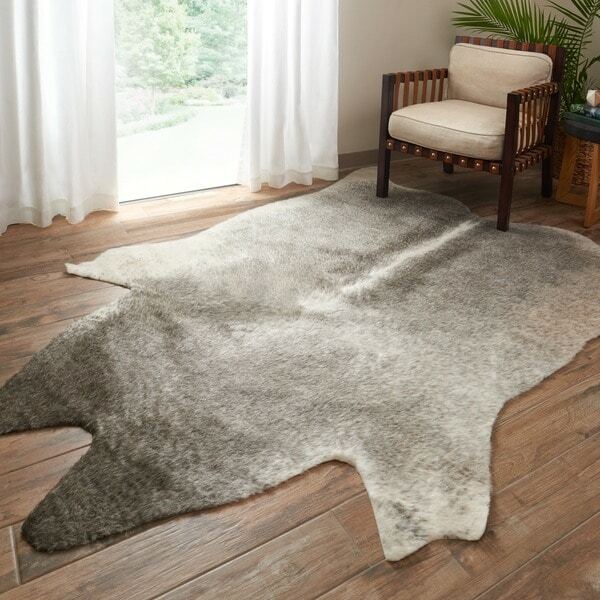 Taking a stylistic cue from the animal kingdom itself, and using a blend of faux fur and animal hide, this rug blends modern styling with a rugged aesthetic and is designed to complement multiple color schemes. The rawhide rug is machine-woven, offering a strong, resilient weave that's ideal for even high-traffic areas. Small: 3 feet 10 inches wide x 5 feet long x 0.3-inch pile height / weighs 2 lbs. Medium: 5 feet wide x 6 feet 6 inches long x 0.3-inch pile height / weighs 3 lbs. Large: 6 feet 2 inches wide x 8 feet long x 0.3-inch pile height / weighs 5 lbs. First off, if you want a real cowhide, go buy a REAL cowhide. This is meant to share the aesthetic as best as possible. Even the best fake leather doesn't feel like real leather, that's the same case here. Now that being said it's a great imitation. I have owned real cowhide before, and having pets, I won't do it again. It's not something that can be easily cleaned. This one is also bigger than what you can find in a real cowhide. Underfoot, it is fuzzier than a real hide, but visually, it doesn't look that much different than real fur, it just stands up a little taller. For my purposes--something with a low pile height and large surface area to go under the dining table, that I can slide chairs over, that won't give me a coronary if I spill something on it because it's not $400-$500-- it's perfect. The color pretty much matches the images. It's shedding a little bit, but since it's already a small amount, I am not worried that it will last. This rug is well worth the money. It does NOT look as fake as people have said. I mean it's artificial, so get over it. I had a real hide rug a few years ago and it was awful. It was super thin and I had to be sure I conditioned it or there would be dandruff...they are more art than functional. Not only that but if you walk in the same spot too much the (coarse & irregular) hair falls out... This rug combines the best of both worlds. The colors are perfect, greys beiges some black and ivories, very neutral. Uniform hair and easy to lightly vacuum. Finally It's nice on my feet (hides will never be PLUSH tho) and it brings a high end flair with it. It's thin but I didn't have to put a non-slip pad, I have bought a few different colors of them for accents in areas that don't get a lot of traffic, as I don't think they would hold up too long under heavy traffic. But I'm a vegetarian & these really throw my guests off, because they look pretty authentic without close examination. I like them also because they are assymetrical & I get really bored with perfect squares and rectangles in my home décor. I used two slightly different ones in my bedroom and they really warmed it up, as well as to create a welcoming little niche in a large room without having hard 90 right angle edges. And, as usual with the stuff I'm reviewing, there's also the price factor which, if you want chic but are on a budget, these are doubly auspicious finds. But the bottom line for me is my title, The Look Without the Cruelty. It's so good to decorate without a guilty conscience. Love this rug! I was looking for a faux hide rug that was very flat so I could easily move a desk chair around and this rug was perfect. Colors are very true to what is shown. I have not had any shedding at all and it laid completely flat from the first day I put it down. Highly recommend! this rug looks great, very soft on the feet. I would recommend. for the price this is amazing. to me it looks real unless you might look really close. but i actually prefer faux over having a dead animal on my floor. i LOVE this rug. Love, love this purchase. The rug is a neutral grey. I placed it over a bigger rug in my living room and the look was beyond spectacular! It added dimension, texture and style! Would buy it all over again! I just got this rug and I love it. However, the size is supposed to be 6'2 x 8'0... After measuring the size is actually 6x4 so it's about 2 feet off on length and width. Not sure if they just sent the wrong one or what, but it looks like a few others have said the same thing. This is a beautiful rug as others have stated. looks very real, beautiful coloring, nice and soft. Please note that there really is not a 8 x 10 as stated in the listing. this rug is actually a 5 x 6.5. It's perfect! Very big and not to fake looking. Beautiful contemporary rug, exactly what we were looking for! Colors are accurate to photos, charcoal grey, white, a touch of brown in certain areas. Works great in my contemporary industrial living room! I was looking for a cow skin rug, and this was a great compromise. The coloring of it is perfect, unlike the unknown factor with a real skin. From a distance, it looks real, close up, it is nice as well. It is thin and will need a pad. It also needs to flatten out, after being rolled up on that tube. 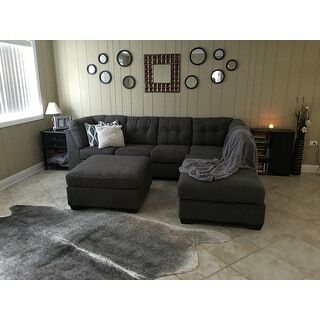 Purchased the large size for my home entry after trying many different rugs, many returns, and almost giving up. Perfect fit for entry 10ft x 10ft with tall ceiling. Eye catching and goes well with my decor. Great find on sale at a good price. Very happy with this beautiful rug. Just what i was looking for to fit my entryway! Very stylish! 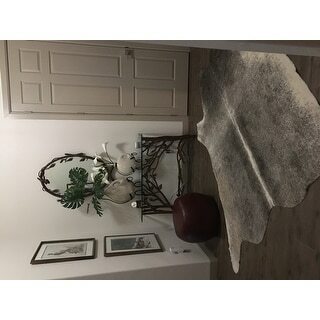 This graciously sized faux cowhide area rug is the perfect accent for so many styles. It currently resides in my contemporary home's foyer. It's varied shades of grey, white and tan easily disguise any wayward dirt or leaves that come in on our shoes. Use with a rug pad to keep its smooth back from sliding. Perfect fit for my husband's office. The rug arrived quickly and in perfect condition. I would recommend this to anyone looking for a faux fur option. This rig looks good when you first get it but over time it wears. Not durable more for show. The color and texture are very nice. Plan on placing it under two chairs in front of a fireplace. 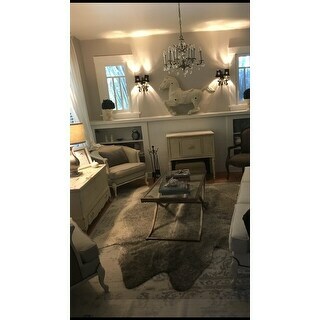 This was a beautiful rug but I returned it for the silver graphite which went perfectly with our modern, glam look but the rug is beautiful. "All of the rugs in our apartment need sound proof padding underneath. Is there anyway to get a pad under this rug?" We would also recommend getting a rug pad around 6x9 and trimming it to fit under the shape of the rug. A second option, and what tends to be a popular decorating touch, is to layer two or three area rugs over each other at different angles. This look usually works best when you have a shaped rug on top. "My cat decided to use the bathroom on my rug, what's the best way to clean it in order to not ruin it?" Professional cleaning is recommended. We recommend testing any cleaning agent in a small corner of rug first. It is also good to remember not to rub the fibers vigorously. Try to blot and rub in the direction the fibers lay. Also, please refer to the back label instructions for cleaning details. "Wondering if the feel to the touch is fake, realistic, soft.... How does it feel?" Yes, this rug takes on the appearance and the feal of the real thing, in my opinion. It is a gorgeous rug. I have it in a 6 x 8 and a 3 x 5 and it looks amazing. I hope this helps? "Do you have this rug on the 6 x 8' size?" Yes. Its a nice product. "Is this machine washable as some of the other brands of faux hide you sell are? I prefer this color but with 3 dogs and a young child, I need to be able to throw it in the washing machine, even if on gentle cycle." This is not machine washable. For cleaning we recommend to clean spills immediately by blotting with a clean sponge or cloth. Vacuum carefully with out beater bar or with bar set on highest setting. 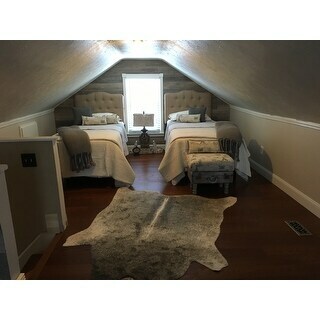 I have wood grained tile plank floors in a mixture of grey,t taupe and ecru....this rug was perfect to blend into the austere look of my minimalist styled bedroom. The room needed a touch of warmth to it. It is placed in front of a Louis Phillippe bed and by the windows is a real cowhide bench. The room is quite large in dimensions and this gave it the right feeling. I do not like rugs (I had my entire home done in wood grained tile planks) and it makes it much cooler in the hot desert environment. However, this rug warms up the feeling of a loft-like space and my feet feel cozy when I walked upon it as the weather is cooling. I just got it today and I am quite pleased with the product. It is NOT the main attraction in my room, just a covering the works very well with my environment.. Yes - it is not REAL - yes - it does not pretend to be - but - it gives a trememndous subtle effect in a stark area. I happen to like it very much! I originally was going for a grey Tibetan lamb throw rug, but this is not as slippery and does not hold dust bunnies in it. It is a very lovely touch for a faux real price!